The Aerotech Aluminium Louvre System has been specifically designed and engineered to enhance the energy efficiency of buildings by controlling the penetration of heat, light, and UV rays. The Aerotech Aluminium Louvre System effectively offers balcony and window openings with efficient means of sun control, privacy, ventilation and wind protection whilst maintaining complete flexibility. Each installation requires our site specific design approach to ensure wind loads and structure requirements meet engineering standards. Panels can be fixed, sliding or bi-folding, controlled by either hand or electric motor drives with optional sun, wind and rain sensors, which enable automatic adjustment in changing weather conditions. 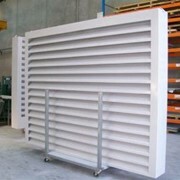 Louvres are available in a variety of blade profiles, powder coat colours and a natural anodised finish. Viva Sunscreens will work closely with you to design the optimum Aerotech Louvre solution in terms of solar control, shelter, privacy and functionality.